We are proud to annouce that Mattress Helper will be sold on Macys.com in the very near future. Macy’s is known as a premier online site for top of the line bedding products for many years. We are so happy that Mattress Helper will be included in their assortment of Basic Bedding products to enhance any mattress for a better night sleep. Macy’s carries a very exclusive selection of bedding products known for their fine quality and value. With Macy’s loyal customer base, Mattress Helper will be given even greater exposure to more people looking for a better way to improve their mattress while saving money. 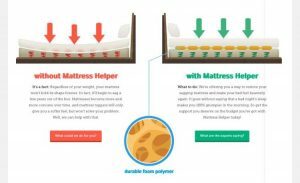 Firm your soft or sagging mattress up again with Mattress Helper! 5 Star Reviews everywhere. Medical Doctors recommended.